Joseph Merrick (or John Merrick) aka The Elephant Man has always been someone that has fascinated and moved me (please see my review of his biography here). I remember being made to watch the film by David Lynch as a thirteen year old at school because my History teacher wanted to get a bunch of rowdy Year 9’s to feel empathy and compassion. I think her exact words were: ‘This’ll teach you empathy.’ It did, for me, but I think I’ve always been ridiculously empathic so it wasn’t a surprise that after around ten minutes, I was weeping uncontrollably. It didn’t, however, work for some of the “harder” Year 9’s who watched, bemused, disgusted and I was reminded that probably not much has changed since the 19th century in terms of attitudes and fear of anything different. I didn’t have huge expectations for the play starring Hollywood actor, Bradley Cooper. My main reason being that I think famous actors doing their stint in Broadway/ The West End is just a way to appear as a “serious actor” and that annoys me. I also think many of these actors are hugely overrated, and acting on the West End without any ability to edit, zoom in, or re-film, would only emphasise this and make for a poor viewing. 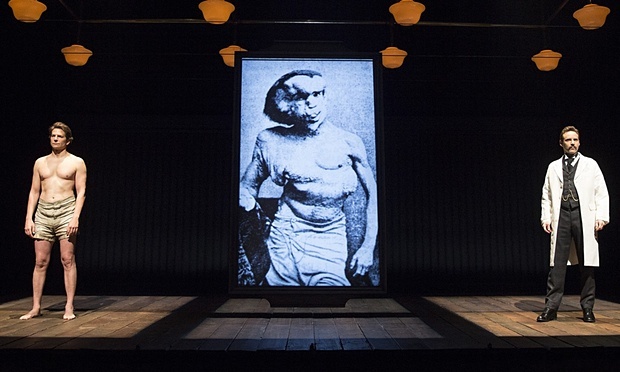 But in particular with this play, I felt that people would be drawn predominantly to see The Elephant Man because “that guy from Hangover” is in it, which I feel is completely disrespectful to Joseph Merrick and his story. To some extent, I feel this was true. I sat in front of some audience members who were vocally bored and actually walked out before the end. The people next to me were similarly rude and fidgety, so I guess I had bad luck with my seats as I spent a great proportion of the night trying not to get too pissed off by the people around me. Bradley Cooper surprised me. I know he’s started to take more serious roles like Silver Linings Playbook and American Sniper but my expectations were low for reasons outlined in the above paragraph. And even more so, when I realised he wasn’t wearing any sort of prosthetics – I imagined I would just sit there throughout the play thinking ‘that’s not Joseph Merrick; it’s just Bradley Cooper gurning.’ But the truth was he was utterly convincing as Merrick, from the way he walked to the way he spoke. He portrayed Merrick incredibly accurately (according to the literature that exists on him) as an intelligent, endearing, earnest individual with an air of innocence and wisdom all at the same time. While Cooper was amazing, the other cast members did not seem to hit the same mark. Treves (played by Alessandro Nivola) was rather bland and uninspiring, which made his internal conflict scene at the end rather difficult to believe. I felt that Patricia Clark, who played Mrs Kendal, the famous actress befriended Merrick was good (despite her English accent) – in particular, the scene in which she shows herself to Merrick is beautiful and incredibly moving. At times, though, I felt that her character was more of a caricature and that detracted from the sweetness of their relationship. Scot Elllis’ direction resulted in the play being fast-paced, unfocussed and erratic at times, however, I really enjoyed the play’s emphasis on Joseph Merrick’s life once he reached Treves – it became more about Merrick’s development as a person rather than merely focusing on the appalling hardship he endured, which was an interesting dimension to explore. A play worth seeing for anyone with an interest in learning about Joseph Merrick but for those who merely want to see Bradley Cooper with his top off and are not interested in learning more about Joseph Merrick, please stay away.